How do you celebrate half a century with an elephant? Rosamond Gifford Zoo in Syracuse, New York recently honored their herd’s matriarch, Siri, as she turned 50 years old! Asian elephant herd mates Romani (41), Targa (34), Doc (20), Kirinia (22), Mali (20), and Batu (2) were all on hand to celebrate the amazing occasion. 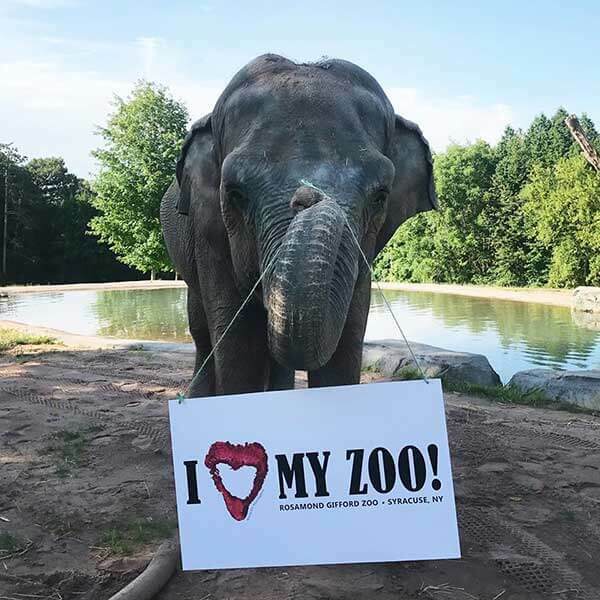 The Zoo held a highly successful series of events, including Pennies for Pachyderms, a fundraiser for elephant conservation of which the International Elephant Foundation was a recipient. 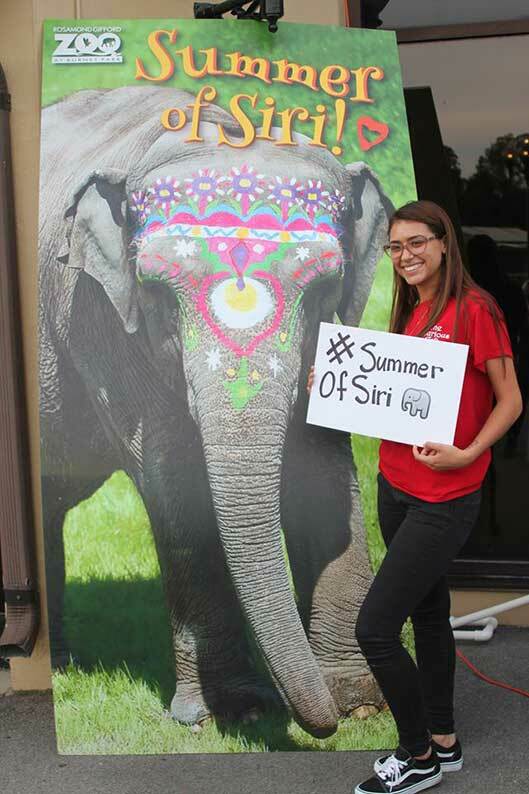 Coinciding with World Elephant Day festivities, the Asian Elephant Extravaganza included a county proclamation declaring 2017 the “Summer of Siri”! Everything from Pachyderm Parties to special docent-led tours, to a Watermelon Smash was held to bring the entire community together to celebrate two generations with Siri. Q: Your Pennies for Pachyderms fundraiser was in honor of Siri’s 50th birthday. What are the names, ages & species of her herdmates? Ted Fox: We have a seven-member herd of Asian elephants. Our eldest, Siri, came to us from the Lincoln Park Zoo in 1972 as a 5-year-old. 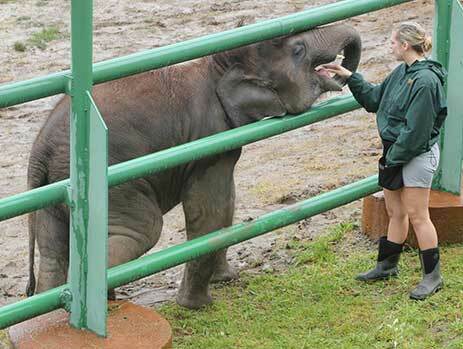 For several years she was the zoo’s only elephant and actually was outgrowing her exhibit. This led to a decision to renovate and expand the zoo in the 1980s. The “new zoo” reopened in 1986 and received AZA accreditation in 1987, and we have maintained and earned accreditation ever since. We also acquired Romani, now 41; Targa, 34, and Doc, our bull, 20. Romani’s daughter, Kirina, 22, and Targa’s daughter, Mali, 20, were born here, and now Mali and Doc have a baby boy, Batu, age 2. Q: What kind of events were featured at Pennies for Pachyderms? How were they received by the public? Ted Fox: Siri has been beloved by the Syracuse community for two generations, so we wanted to celebrate her 50th in a big way. 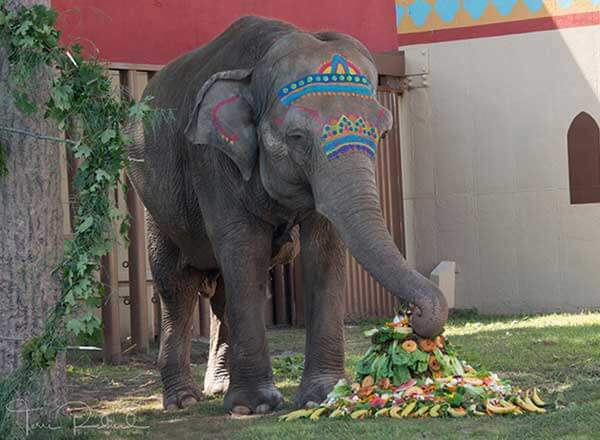 We decided to have her birthday party at our Asian Elephant Extravaganza held every August the week after World Elephant Day. We asked our County Executive for a proclamation declaring summer 2017 the “Summer of Siri” and planned several events leading up to her August 19 party. The events included Pachyderm Parties, special days that included “Elephant Walk & Talks” – docent-led tours up to Asian Elephant Preserve – and Watermelon Smash, when our elephant keeper chats included giving watermelons donated by Tops supermarkets to our herd. We kicked off the “Pennies for Pachyderms” fundraiser at our “Summer of Siri” press conference June 6 and kept it going all summer. Janet Agostini: We felt the best way to honor Siri would be to do something for her counterparts in the wild. I had seen another zoo do something similar and decided to borrow the idea. I thought our community and guests would respond, and it was a way to get our very youngest guests involved because when you talk about pennies it implies emptying out your piggy bank. We kicked off Pennies for Pachyderms with $100 in pennies from the Friends of the Zoo, and the Friends offered a matching gift of up to $2,000 if we met that goal by Siri’s party. This resulted in longtime zoo supporters Bob & Zalie Linn also offering a matching gift if we reached the $2,000 goal. 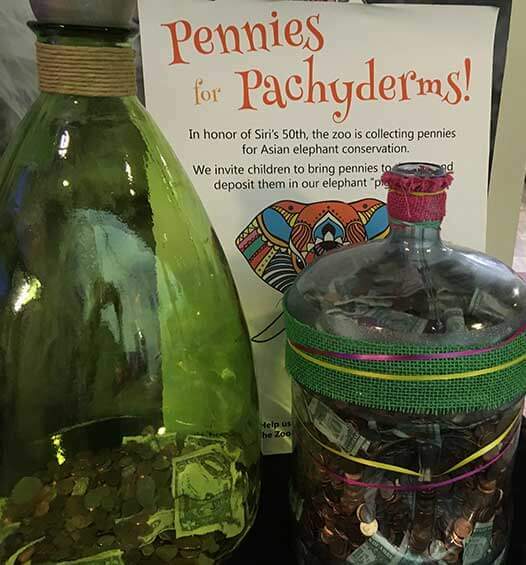 We put a five-gallon “bank” in the zoo lobby and asked people to bring their pennies to the zoo. The response was tremendous. Many families brought bags full of pennies to the zoo, and many adults threw in a few bills. By August 19, we had filled three five-gallon banks with a total of $3,211.07 – more than $1,000 over our goal. With the matching gifts, we were able to give $6,000 for wild elephant conservation, $3,000 to the IEF and $3,000 to AZA SAFE. I knew people would respond, but their generosity exceeded my expectations, and whenever you surpass a goal like that it’s just a testament to how many people love Siri and love our elephants. 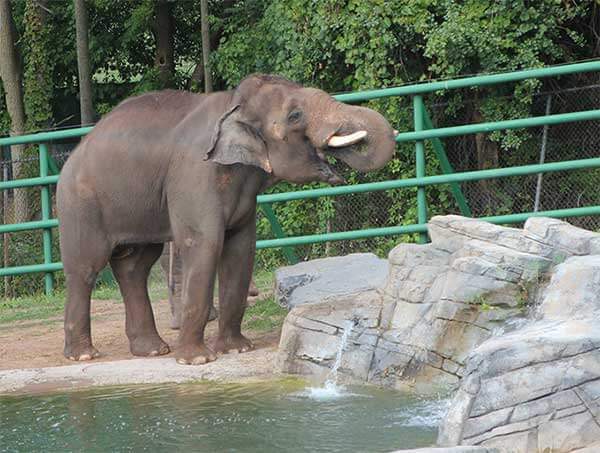 Q: How have you each seen visitors impacted by the elephants they experience at the zoo? Ted Fox: I have seen the impact especially with Siri. This is a generational community that grew up with an icon who is the face of the zoo, and the people in this community feel like they truly know a zoo animal personally. In terms of memories, seeing something as magnificent and memorable as an elephant for the first time and learning about how amazing they are, and being able to take a family picture near it, or on our statue of a baby elephant, is a story we hear all the time, that that made a big impression on individuals and families. Janet Agostini: I see visitors impacted greatly as they watch and get to know our herd. When I see people up at the Asian Elephant Preserve exhibit, they seem so relaxed and so at ease as they watch the elephants move around and interact. It prompts you to slow down from your usual life and just take it all in. It centers you. I think there is something magical about seeing elephants on natural turf, being able to wander where their interests take them, whether to drink from the watering hole or chase a gopher out of the exhibit. Some people have told me they come to Asian Elephant Preserve to meditate. It’s that calming. Q: What role do you believe zoos play in securing a future for elephants? Where does the Rosamond Gifford Zoo fit into that future? 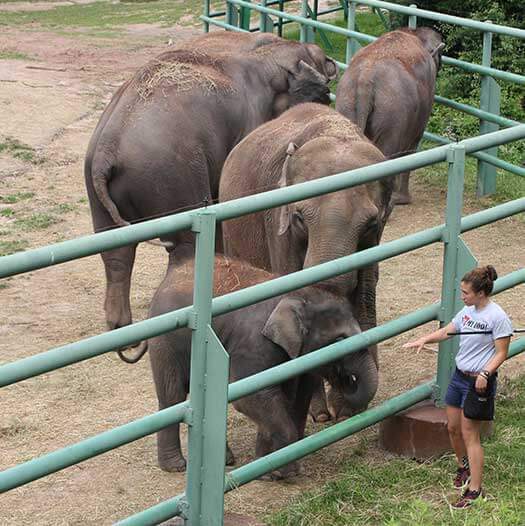 Ted Fox: At the Rosamond Gifford Zoo, we take every opportunity to learn more about every aspect of the health and well-being of the elephants under our care. We will continue to collaborate with world experts on contemporary reproductive challenge of maintaining both the wild and captive elephant populations, and we support those goals financially too. We keep up with all the training courses and we collaborate with experts on both in-situ and ex-situ philosophy on elephant care and well-being and how to stay relevant. We talk to other elephant experts all the time and we continually strive to do better for our elephants, especially in creating an environment that’s stimulating and enriching. We added a 50,000-gallon watering hole to the 4 ½-acre preserve last year that was yet another component of our exhibit meeting our goals. 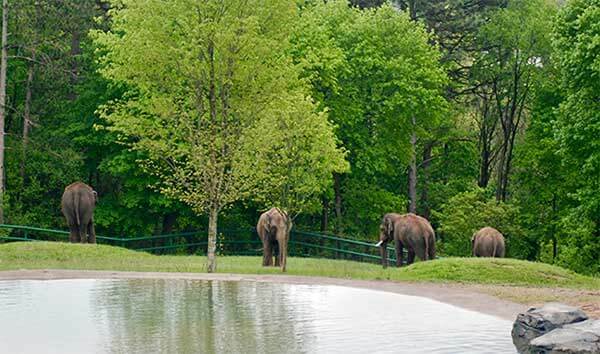 I was invited to do a presentation at the recent AZA Conference about our elephant pool’s green infrastructure, and it is our understanding that it’s the first elephant exhibit ever where no water from the exhibit goes into storm or sewer systems. It all goes into a bio-filtration basin, so there’s zero impact on the municipal water system infrastructure. Elements like this and the green roof on our elephant facility demonstrate how we always combine responsible stewardship of our community and our property with everything we do. On the table now is another enhancement that will create a 340-degree experience for our visitors of getting closer to the elephants and at the same time create a more complex environment for the elephant herd. Q: Your elephant program has been very forward-thinking when it comes to elephant training and management. Your zoo and staff were leaders in elephant management in helping found EMA, initiating JEMA and developing the AZA Principles of Elephant Management. Can you tell us about your elephant management program and the staff behind it? Ted Fox: Our expertise in elephant management and contributions to the EMA and AZA started with former elephant manager Chuck Doyle along with senior keepers John Moakler and Mick Case. John and Mick are both technically retired but still work part-time with our elephants, and they each bring over 30 years’ experience in elephant management to our team. Elephant staff member Seth Groesbeck has been here 18 years, and our elephant manager, Ashley Shepperd, and keeper Cassie Guerra have each been here 9 years – so we have about 110 years of experience with elephants on our staff. Under the AZA principles of elephant management, all of our staff have to take elephant management classes. We currently have six full-time and two part-time elephant staff, plus two other part-time staff and two interns. I encourage our staff to stay connected on a daily basis to the EMA community, and there are no limits to our support of our staff regarding staff development in elephant care and husbandry, from elephant management and training to reproduction to research. Elephant staff Seth Groesbeck and Ashley Sheppard both attended the EMA Conference this year, and Ashley is going to Houston, TX, for PEM 2 class. We also sent Ashley to India to visit an elephant work camp to learn how working elephants are managed. Our staff is in constant contact with other elephant experts around the world with the goal of managing our herd better and creating better welfare opportunities for the animals while also maintaining a safe work environment for our staff. Q: Can you tell us about your breeding program? Ted Fox: There are a lot of questions about elephant reproduction and the future population of Asian elephants. We participate in as many projects as possible and collaborate with as many professionals as possible to collect as much data as we can to help future generations. Since 1990 we have had six elephant calves born at the zoo, five of which survived. A big achievement two years ago was the birth of Batu, a male calf who represents a third generation within our herd. His mother, father, and grandmother are here and form a close family group. We are excited about continuing our efforts to create more naturalized herd dynamics, with multiple generations in a matriarchal system like those in the wild. Q: Does your elephant herd do any demonstrations meet & greets, or other activities where zoo-goers can experience elephants beyond watching them on exhibit? Ted Fox: All of our elephant staff do keeper chats, which we offer twice a day on weekends from May through September and every single day in June, July and August. Crowds of people gather on our elephant overlooks and amphitheater at Asian Elephant Preserve to watch these demos and have a chance to question our keepers. During the keeper chats, two or three keepers will use hay, treats and commands to bring our elephants out and down to the fence, which is really impressive when you have six or seven elephants come out as a herd, including a baby. The keepers then run the elephants through some basic training commands like raising their feet or showing their tusks and explain how and why we train for these behaviors in order to perform all the exams, observations and care that we do to keep them happy and healthy. Sometimes the demos will include enrichments like “watermelon smash,” an elephant birthday “cake” made of fruit, browse or treats that they have to work to get, etc. Besides the demos, we do offer an opportunity for people to purchase a behind-the-scenes elephant encounter that allows them to go into the elephant barn and see a couple of our elephants up close and get a private keeper chat. We also collaborate with our licensing and accrediting bodies whenever possible to have open conversations with and allow them to view the program we’re so proud of here. Q: Does your herd participate in any studies or research projects? Q: How did each of you get involved with animals, zoos and conservation outreach? Janet Agostini: I have loved animals all my life, so working for the zoo was just a natural fit, and it is a real privilege to be able to devote my working life to their benefit. I became an animal lover as soon as I got my first kitten as a little girl in Michigan. Much to my mother’s chagrin, my father rented a small farm when we were stationed in Michigan, and the landlord brought an animal to each of us kids. Mine was a cat, my brother got a dog. We bought a couple of horses and we were underway. I have always had animals in my life. When I was offered the position of President and CEO of the Friends of the Zoo 11 years ago, I felt it was the perfect fit for me — I could bring my business background and fundraising skills to benefit a cause I so firmly believe in. Being able to observe and interact with the animals on a daily basis is one of the best parts of my job. Ted Fox: My dad taught large animal medicine at Cornell University and I started going on farm calls with him at age 6, and when I was old enough to work, I would work at different farms every summer. I also had racing pigeons from the time I was 10, and that turned into chickens and waterfowl and everything else. I had a guanaco in tenth grade because a circus came through Binghamton and some stupid teenager stuck a candy apple stick and in the eye of a baby guanaco. They brought it to Cornell and when they told the circus how much it would cost, the circus said, ‘Never mind, we don’t want it.’ I happened to be there and I said, ‘I’ll take it.’ That was the first weird animal I had (laughs). I majored in animal science at Cornell with no history at zoos until I was nearly out of college. I ended up volunteering at this zoo in the bird department and then I took a summer job the next year and the following spring I was hired as a keeper. I’ve been here ever since. And though I have been offered jobs at other zoos, including San Diego and Disney’s Animal Kingdom, I ended up staying here for the quality of life, family and a strong belief that the Rosamond Gifford Zoo is a truly special place that has so much to give to the Central New York Community. As you can see the Rosamond Gifford Zoo team is dedicated to their elephant herd and elephants around the globe. They’ve made a commitment to helping their elephant ambassadors make a real impact in their community and beyond. IEF is honored to receive their support!